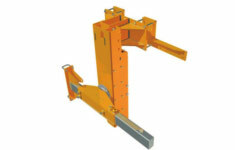 Single beam structure in non-deformable caisson with up and down move jack, stroke 700 mm, equipped with a safety valve. Quick coupling with welded plate for front-end mounting on vineyard tractor. 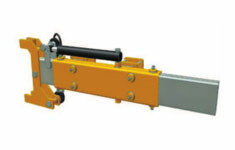 Hydraulic offset 1370 mm by jacks with automatic bleed. Inclination +/-20°, quick coupling with welded plate for front-end mounting on vineyard tractor. positioning the machine as an extension of the tractor, for limiting the dimensions. Front attachment, quick coupling with welded plate for front-end mounting on vineyard tractor, bracing bars with tie rods. 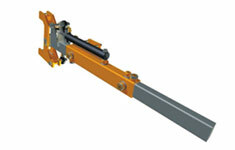 Stroke 300 mm., hydraulic inclination +/- 20° with standard or semi automatic attachment. 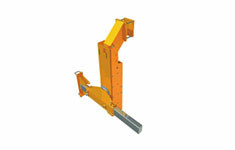 Stroke 500 mm., hydraulic inclination +/- 20° with standard attachment only. 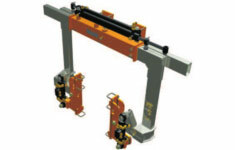 Hydraulic returning system with hydraulic translation sleeve stroke 300 mm. 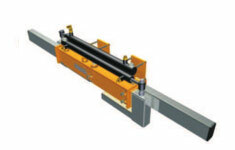 Simultaneous hydraulic opening 1000 ou 1400 mm. 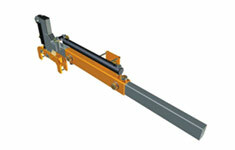 Hydraulic returning system with hydraulic translation sleeve stroke 300 mm. Mounting on three tractor points, with universal joint. Can be delivered in standard version with arm rest or on demand with an ergonomic handle on box.